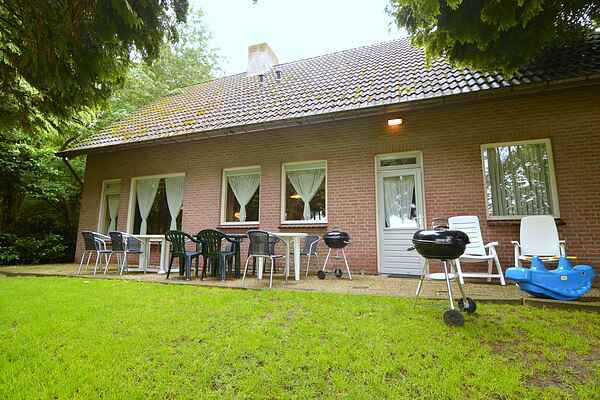 This detached holiday home is situated in the bell tower village Asten in Brabant. The cottage benefits from a spacious playing field with play installations which will surely amuse the children. A small agricultural enterprise is situated on the grounds near the cottage.Its rural location makes Asten the ideal region for walking and cycling. Discover the national park De Groote Peel or visit one of the two large bell foundries in the Netherlands: the Koninklijke Eijsbouts. And of course there is the Carillon and the Nature museum with an unique collection of bells, chimes and tower clocks. Try your hand at 'rural golf' (the fastest growing outdoor sport in the Netherlands) in Pension de Heidebloem in Liessel. You can enjoy the game and the Brabant nature amongst the horses, cows and ditches. Fun excursions with the kids are : Trollenland in Deurne, Toverland in Sevenum, Animal park Europa and Oostappen with a sub-tropical swimming pool, nature pool, indoor playground and bowling. In short, both the cottage and the region offer enough activities for a cosy family weekend for example! When its cold take an extra blanket or sleeping-bag with you.